Inspired by a commission I bought from beowulf100 on FurAffinity. So I had commissioned a drawing of my dogboy character being tucked into bed by both Toriel and an anthropomorphic Fluttershy. 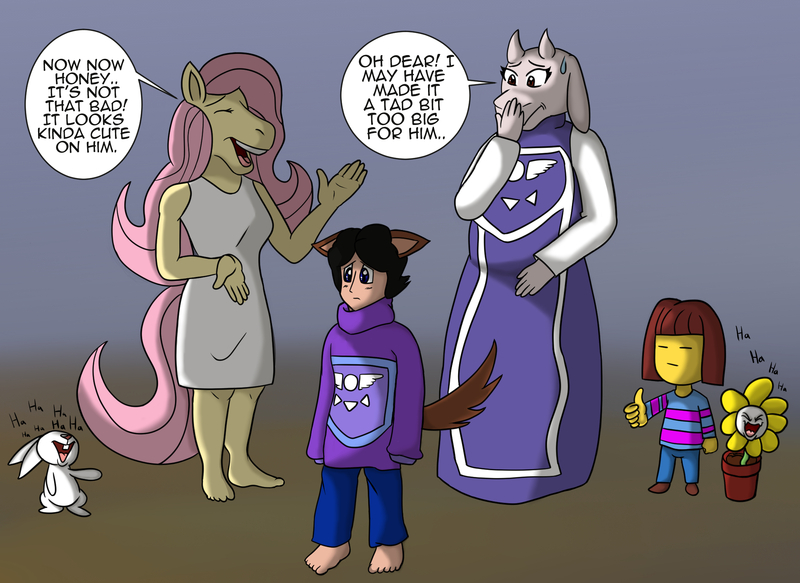 This led to a fanfictiony idea to where my dogboy was the adopted child of a married Fluttershy and Toriel. This led to even crazier crossover ideas that I haven't drawn yet like in this universe Goku and Krillen are deputy police officers and Goku is the friend of the family. Yeah it got pretty insane haha!! About the drawing itself, Toriel made my character a sweater with a similar design to her dress however she may have made it a tad bit too big. Fluttershy assures Toriel it's alright and Frisk seems okay with it. Flowey and Angel bunny are both probably the most amused as they're having a riot over how big the sweater looks on my character. And my poor dogboy's just standing there unsure what to think of this whole predicament.